For many years, the traditional Maritime Education and Training (MET) approach has been the vehicle through which seafarers are prepared to serve onboard ships. A key principle governing MET is ensuring all seafarers are trained according to the minimum standards set under the International Convention on Standards of Training, Certification and Watchkeeping (STCW). Although this principle is applied by most MET education providers, there is a general consensus in the literature that quality issues still exist for seafarer training. Apart from the low quality of some of the seafarers trained by some MET providers, other key deficiencies appear to exist for seafarer training in the 21st century. This paper argues that the current education paradigms being used for the training of seafarers appear deficient in the face of the growing manning crisis among shipping industry employers. Specifically, the crux of the training provided by all MET institutes fails to address the varying career expectations of seafarers. To a large extent, the focus on MET has been on emergency response and technical training. Given the high rate of attrition among ship officers within the global shipping industry, it is important that current paradigms used for the training of seafarers are revised to address the long-term labour needs of shipping industry employers. This may be achievable if the current seafarer training programmes used by MET providers are extended to promote a more sustainable career path for seafarers from leaving school until retirement. From a practical perspective and as per the tenets of staff development and training in general, the changing nature of work and the work place environment requires that employees are trained to enable them to adapt and be flexible in line with future career changes. The literature provides evidence that the retention of ship officers is a key human resource challenge that needs to be addressed. With limited career options within the shipping industry, seafarers may be compelled to seek jobs in other industries. Considering that the high level of attrition may worsen the prevailing labour crisis in the shipping industry, pragmatic measures are needed at all levels within the industry to improve retention. 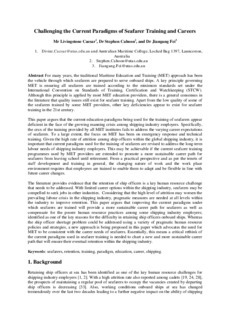 This paper argues that improving the current paradigms under which seafarers are trained will provide a more sustainable career path for seafarers as well as compensate for the poorer human resource practices among some shipping industry employers; identified as one of the key reasons for the difficulty in retaining ship officers onboard ships. Whereas the ship officer shortage problem could be addressed using a variety of pragmatic human resource policies and strategies, a new approach is being proposed in this paper which advocates the need for MET to be consistent with the career needs of seafarers. Essentially, this means a critical rethink of the current paradigms used in seafarer training is needed to chart a new and more sustainable career path that will ensure their eventual retention within the shipping industry.